Gavin had his 9 month doctor's appointment today. He is now 14 lbs and is 26.5 inches long. He is still way off the percentile chart! He is just a little guy! He is still throwing up, and I think it is when I have chocolate. So, I have to cut that from my diet right now. I am pretty sad about that, because I LOVE chocolate....but I can do without for a few more months, right? Whenever I am concentrating really hard (like when I'm playing Guitar Hero! ), the tongue is out. Or, for example, right now, I just noticed it was out while I was typing. Well, Gavin has the same problem...the concentrating tongue gene. It is always out! I always thought that Gavin went down for his naps, and then when he wakes up he cries, and I go get him. Well, today, I thought he was sleeping longer then usual, so Casey and I went to check on him, and there he was, in the middle of his crib playing with his stuffed animal. We sat and watched him for a while, without him knowing we were there, and it was so fun to see him "play". 1. Each player lists 6 facts/habits about themselves. 2. At the end of the post, the player then tags 6 people and posts their names. So here it goes I hope you don't get bored. 1. 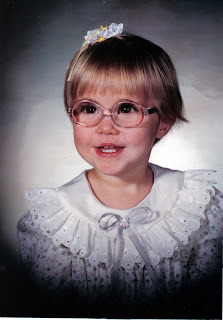 I was born with crossed eyes and had to wear glasses at the age of 2. After 3 surgeries, I am now glasses-free and have perfect eye sight! 2. I enjoy movies, but I am famous for falling asleep while watching them. I have even fallen asleep while at the theaters waching "Shrek 2" and "Lord of the Rings". Both great movies, I just was tired...I guess! 4. I am proud to say I weigh the same as I did in Jr. High, thanks to breastfeeding. 5. I played dolls and barbies with my friend Laura when I was in Jr. High...(that is way too old to be playing dolls and barbies). 6. I am allergic to metal. 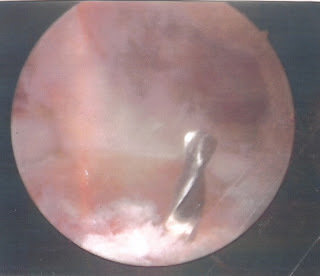 I had my ACL replaced, and they use a screw to hold it in place. I had a reaction to it and had to go back into surgery to get it taken out. Gavin is 9 months old today. He is a very happy baby, especially if mom is around. He has been fighting a cold for the past couple of weeks, so it is so nice to see him back to being a smily baby again. He has this game he likes to play. When I am changing him, he always trys to get away. If he gets away, he crawls as fast as he can to his little music table toy he loves. He starts to laugh if I say "I'm going to get you", and crawls even faster. He is such a joy to have in our lives! Gavin loves looking at himself in the mirror. I have a big mirror that is behind my door in the bathroom, that hasn't been hung up yet. When he finds it, he likes to touch it and give himself "kisses". Now he has figured out how to move it, and that keeps him pretty entertained. We just got back from our relaxing vacation in Mazatlan. For my graduation present, my parents gave us a free week to stay in one of their condos. Doug graduated too, so we decided to take our trip together with Autumn and Doug. I went to Mexico a few years ago, and loved it, so we decided to go there. We stayed at a really neat resort. Everything we needed was right at the resort, so once we got there, we didn't have to leave. We had a few restaurants to eat from, a little grocery store, pools, private beach, it was so nice! Every morning we would sleep in (as much as Gavin and Braxton let us), put on our swim suits and head to the beach. Gavin would usually fall asleep in my arms, and I would just lay out and hold him. Casey spent a lot of time out body surfing, I even made it out there too! After spending time at the beach, we would go lay at the pool and swim a little bit. After that, we would get ready, and take naps, read or watch movies. In the evening we would go eat, and then come back and play games. It was a wonderful vacation, but it felt really good to be back sleeping in my own bed! Casey and Doug body surfing....they look a little cold. Don't you love their matching necklaces? Sitting next to the pool having lunch. Happy New Year! 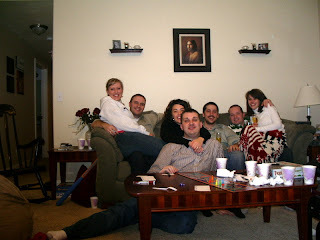 We had a great time at Autumn and Doug's. We had great food, great company and great games. The next morning we were up at the crack of dawn and went to breakfast with Casey's family at IHOP. I hope 2008 is just as good as 2007. It was a wonderful year!